Pre-heat the oven to 200°C. 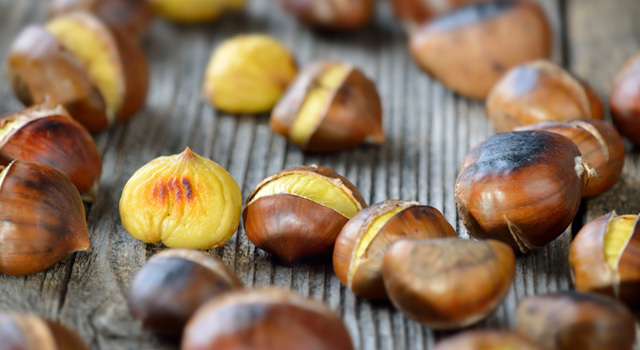 Use a sharp knife to slit the chestnuts on top to form a cross. Arrange the chestnuts on a baking tray and put them in the oven for 10 minutes. Then turn them over and roast them for a further 10 minutes. The chestnuts are now ready to serve..
Cook the fresh chestnuts in boiling water for 5 minutes, then remove the shells from the chestnuts. Peel and chop the onions, heat the butter and sweat the onions in the melted butter until they are translucent. 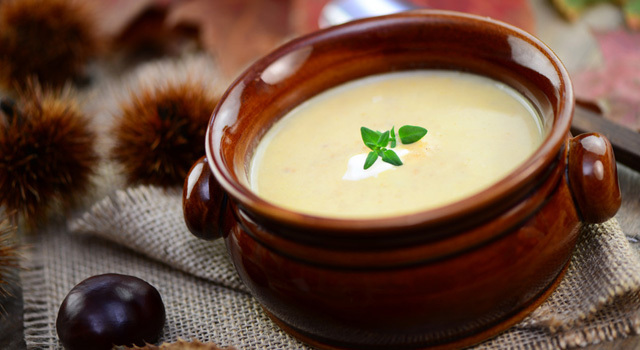 Cut the boiled chestnuts into small pieces, add to the butter and onion and then add the vegetable stock. Simmer for 30 minutes on a low heat. Then add the cream and the milk and continue simmering for 5 minutes. Purée the mix using a hand blender and season to taste. Garnish with the strips of chilli before serving. 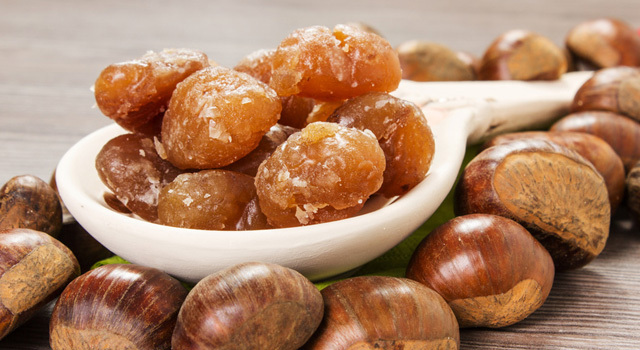 Cook the fresh chestnuts in boiling water for 5 minutes, then remove the shells. Using a dry pan, dissolve the sugar slowly until it is a golden yellow colour. Pour the water over the dissolved sugar but do not stir – simply reduce the liquid down. Add the shelled chestnuts, allow to heat up briefly and then add a large piece of chilled butter and the mint leaves. Reduce the mix down until the chestnuts are glazed and take on a light and fresh hint of mint. Then serve.